Emma Moseley (neé Emery 1855-1926) with her four children, from the left, William (1882-1956), Henry (Harry 1881-1933), Sarah Ann (1879-1957) and the youngest Patience (1884-1959), the old lady seated is the mother of Emma, Emma Green (neé Chambers 1820-1898). This photograph was taken in the backyard of 2 Caldmore Road, Walsall around 1890. Next to the family group is what is thought to be the only known picture of Emma’s husband, Henry Moseley (1880-1886). I cannot be absolutely sure it his Henry but in the top left corner of the negative the name “Moseley” is inscribed preceded by what looks like a letter “H”. The fellow in the picture looks an affluent chap, would a silver-plater, that was his occupation, have looked like this? Henry died aged 36 on the 30th November 1886 at the Brompton Isolation Hospital, Kensington, London, what was he doing in hospital 120 miles away from his home town and more to the point why? 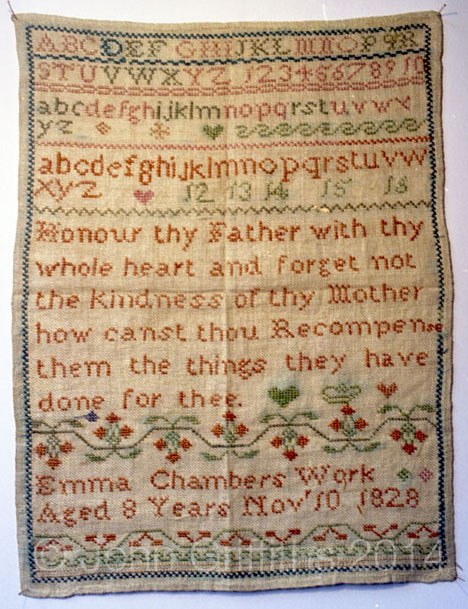 The sampler completed by Emma Chambers in the picture above in November 1828 when she was aged eight. She was born on 12th March 1820 at 42 Beacon Street, Lichfield to William and Sarah Chambers, a family that were quite affluent and well educated. Both her parents could read and write, I have Sarah’s book, the London Art of Cookery from around 1810 that includes notes written by her. 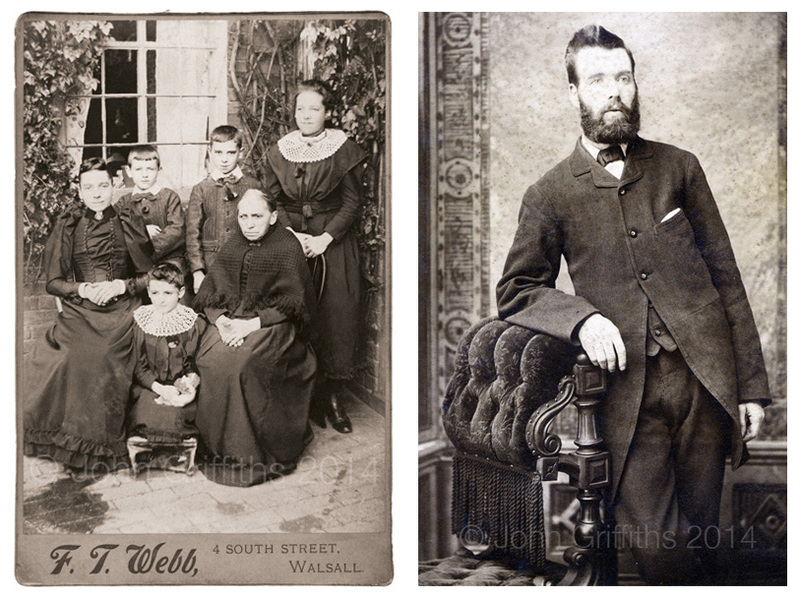 Two of her brothers, John (1812-1862) and William ((1815-1894) were churchwardens at St. Chads Church, Lichfield. Emma had an interesting life as she was married three times. Her first marriage was to Thomas Emery of Footherley, a coachman and later victualler. They married on the 8th January 1852 and had four children Eliza Ann (1853-1927), Emma (my great grandma, 1855-1926), Thomas (1856-1923) and Sarah Ann (1858-unknown). 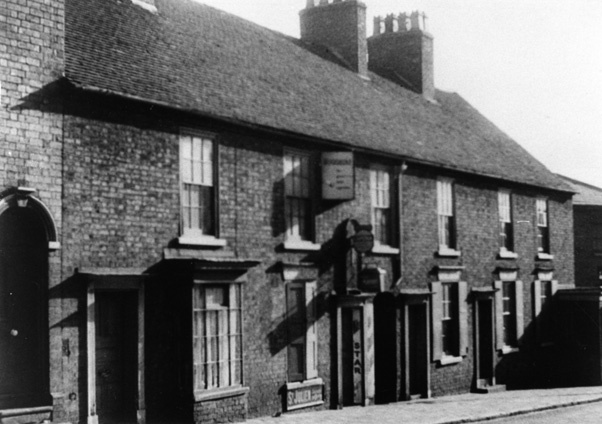 At the time of Sarah Ann’s birth they were living at the Fox Inn, Stafford Street, Walsall with Thomas listed as licensee. His tenancy was brief however as on the 11th October 1859 he died aged just 38. His body was brought back from Walsall for burial in St. Michaels Church, Lichfield. 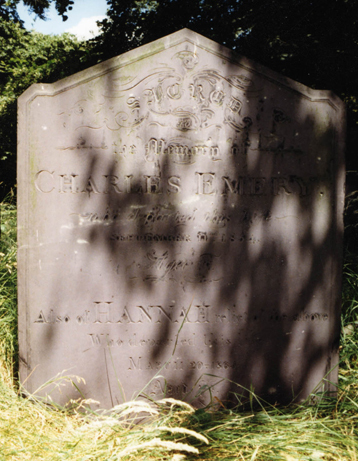 Whilst looking for the gravestone of Thomas I found that of his parents, Charles (1777-1854) and his mother Hannah (1791-1865) but not the one for Thomas. Emma’s married again on the 30 October 1860 at St. Chads, Lichfield to Charles Ross a 50 year-old butcher of Portland Street, Walsall. This marriage lasted for 7 years until Charles’ death in 1867. One year later she dipped her toe into the matrimonial stakes yet again marrying a 50 year-old chain maker, William Green. The 1871 census shows William and Emma living at 27 Pleck Road, Walsall along with her son Thomas junior from her first marriage. What happened after that with regards to William is unknown, I have yet to find a death for him but in the 1881 census Emma was listed as a lodger at Mary Pittam’s house, 65 Pleck Road, along with son Thomas but no sign of William Green! The 1891 census lists her as being a patient at the Cottage Hospital in Bradford Street, her death came 7 years later on the 28th November 1898 aged 78. 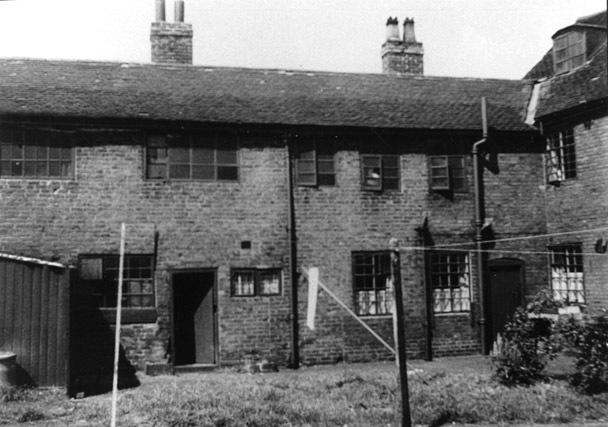 At the time of her death she was living at 109 Raleigh Street, Birchills, Walsall. Emma Emery and Henry Moseley married on 17th May 1875 at St. Matthews Church, Walsall. The marriage certificate of Emma Emery and Henry Moseley. When Henry Moseley died in 1886 I was told my great grandmother, Emma had to find a means of support and she did this by selling newspapers from the doorstep of 2 Caldmore Road (now Little Caldmore) but this romantic tale of hardship overcome seems unlikely. In the 1884 Kelly’s Directory for Staffordshire it lists Henry Moseley at 2 Caldmore Road as a Tobacconist. This discovery raises two questions which will probably never be answered, was Henry still working as a silver-plater or did he know he was terminally ill and made provision for this by providing his widow and children with an income after his death. In the 1911 census Emma had two children still at home, Sarah Ann (Gt. Aunt Sal) and my grandfather William along with her first grandchild, Thomas Richard Henry Dalley, the first child of her youngest daughter Patience and her husband, Thomas Dalley who married in 1907 at Stourbridge. 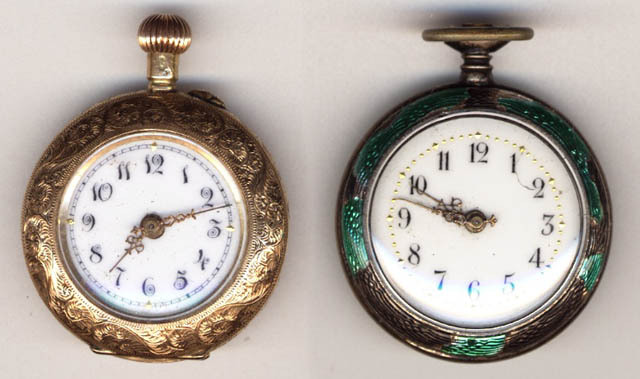 Emma’s two watches, the gold one being used for Sundays only. 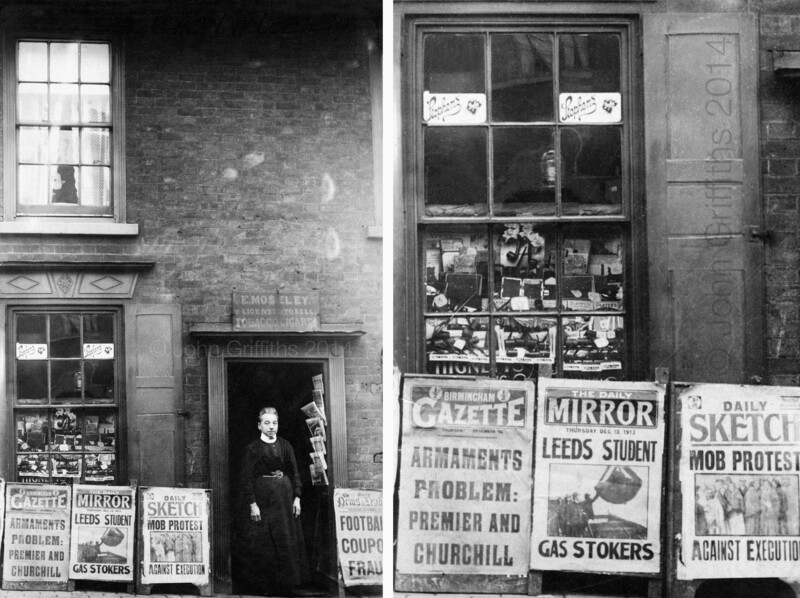 Emma outside 2 Caldmore Road on Thursday 13th December 1913 and a close-up of the shop window. 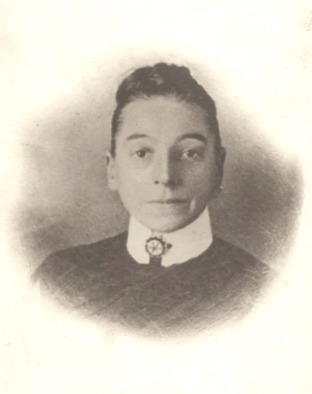 Throughout the following years up to her death in 1926, Emma was helped in the shop by her eldest daughter Sarah Ann or Great Aunt Sal as she was known. Sarah remained unmarried although she did have an admirer, one Francis John Richardson of Eldon Street, Chuckery. It was common knowledge apparently that Emma did not like Frank Richardson and thought him rather uncouth for her artistic and eccentric daughter Sarah. They were a real “chalk and cheese couple” Sarah and Frank, after courting for many years they eventually married six weeks or so after the death of Emma which substantiates the claim that she did not approve of their union. Sarah and Frank remained seemingly happily married until Sarah’s death in 1957 and throughout this time they continued to run the shop. Frank continued with the shop with help from my mother until he was taken ill in the early 1960s. My mother then ran the shop until Frank’s death in July 1962. As a young lad of ten or so I thought Uncle Frank and Aunt Sal were great, they were different. Frank always had a good tale to tell, especially after a drink or several, he told of his betting exploits at Wolverhampton or Birmingham Races when he hadn’t enough money to get home so he walked back! Then there were the “good days” when a taxi was hired for the return journey…..and they stopped at every pub between Dunstall Park and Walsall. In contrast Sarah was teetotal, just as well really, could have cost them a fortune if both had partaken. She enjoyed painting all her life, from a young girl through to old age as well as being a member of an orchestra in Walsall, she played the violin and also wrote poetry. 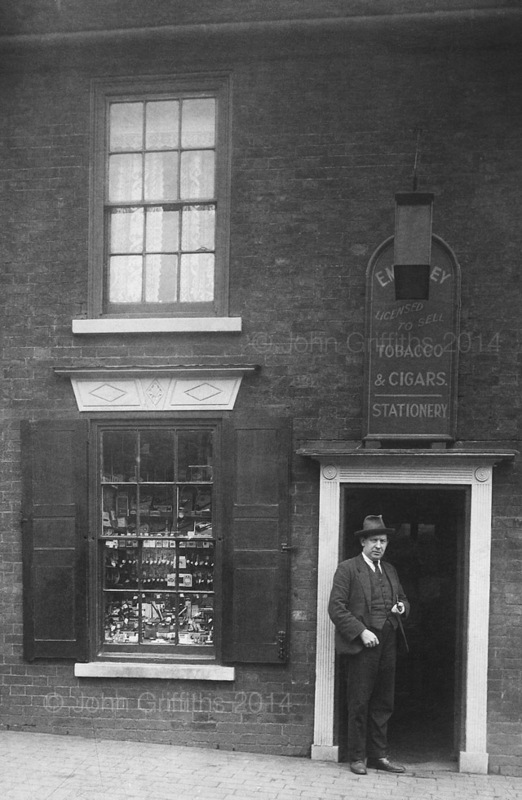 The shop c.1930 with Frank Richardson posing for the camera. 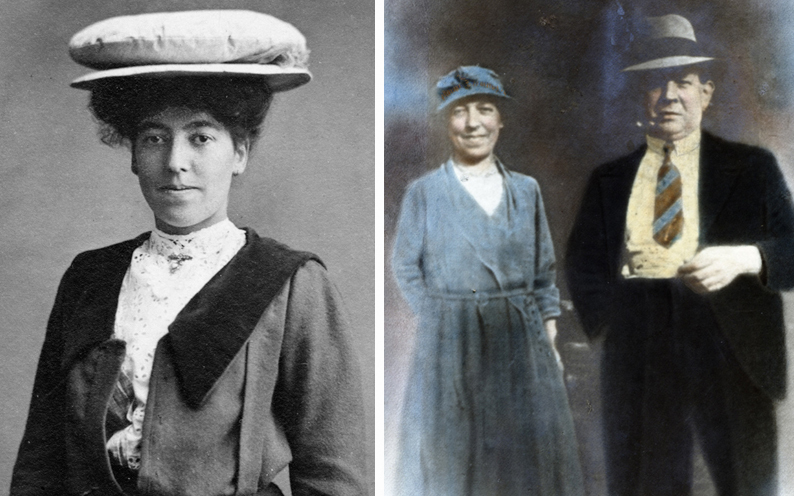 Aunt Sarah in her younger days sporting an interesting design in headgear and in later life with husband Frank in a hand-tinted photograph. When the shop was cleared of stock after Frank died it was my parents job to clear the place of it contents and what a Pandora’s Box it was too. The upstairs rooms were full of oil paintings, oil paints, easels, four or five leather golf bags a considerable quantity of hickory shafted golf clubs, clothing by the rack full, violins, etc. Not realising their worth back in the 60s my father told me to break up the golf clubs, the head was sawn off and the shaft broken in half! Hindsight….what’s that? The houses the Moseleys’ and other families lived in were originally built in 1824 to house leather workers and those of allied trades. Thanks to the foresight of the Caldmore Housing Association the properties were renovated in 1984 and remain occupied today. The rear of the houses that consisted of a courtyard, outside privies, a wash house and brewhouse. Walsall Local History Centre. Ref. No. 3272/W. The houses photographed in 2012. « Thought for the day! 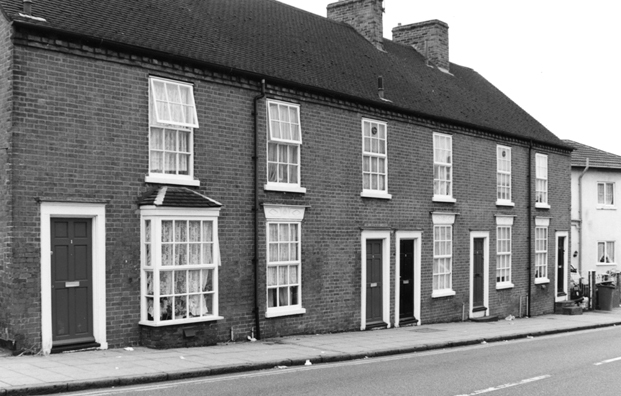 You are currently reading The Moseley family of Caldmore Road at Walsall Life.